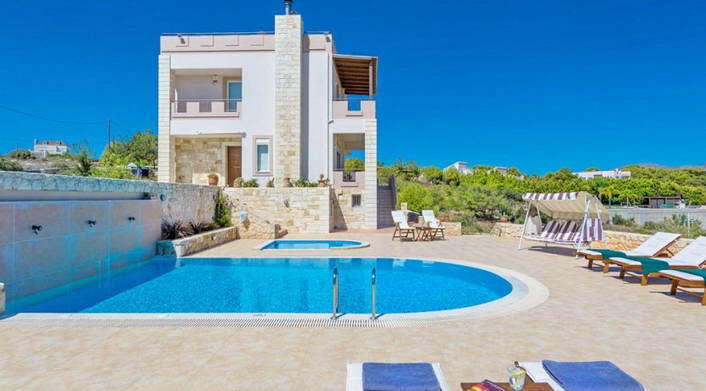 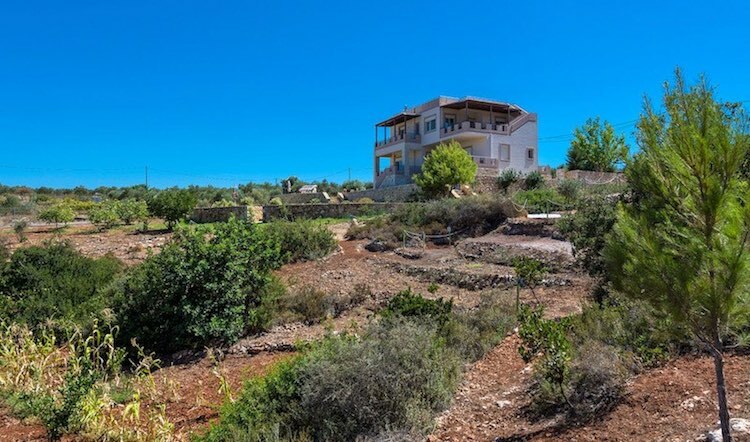 This is a villa for sale in Akotiri Chania. 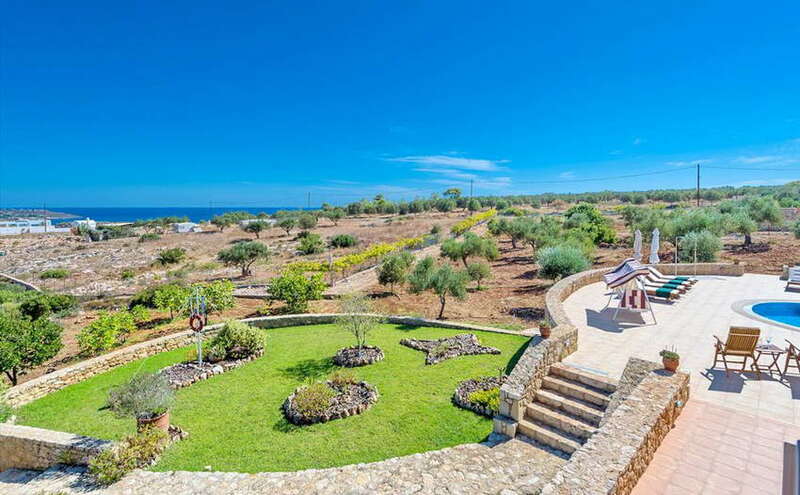 It is located in Kalathas and it is built on a 12,000 sq.m plot of land. 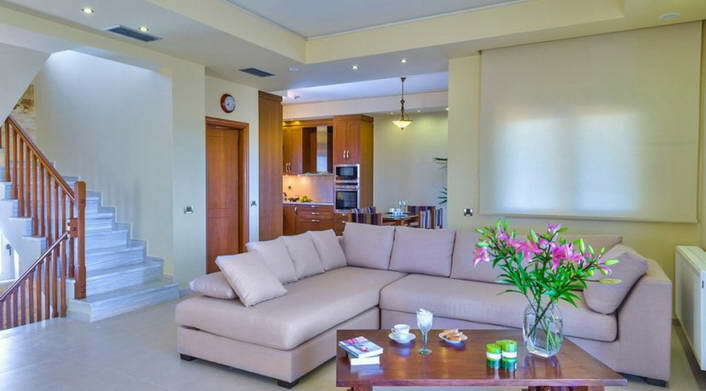 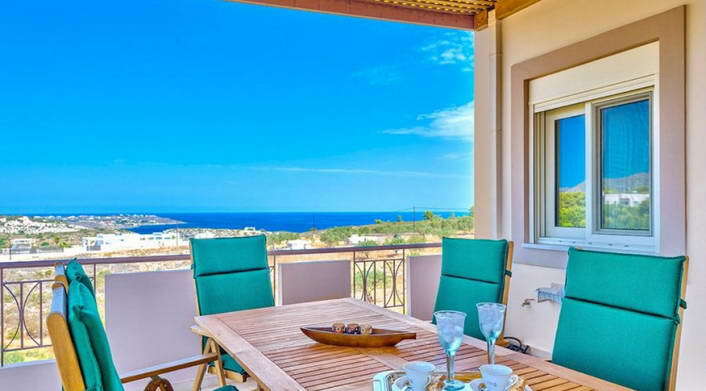 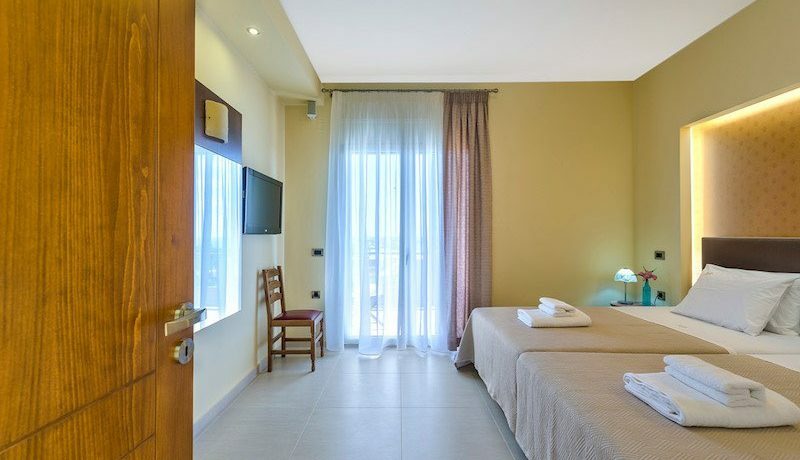 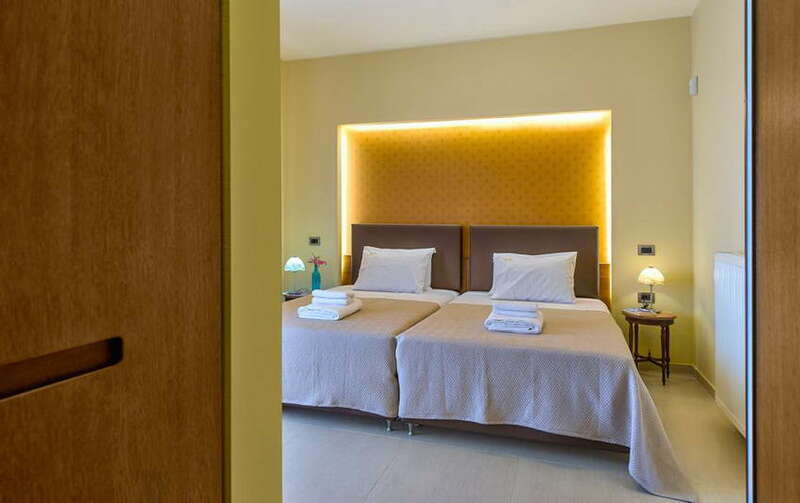 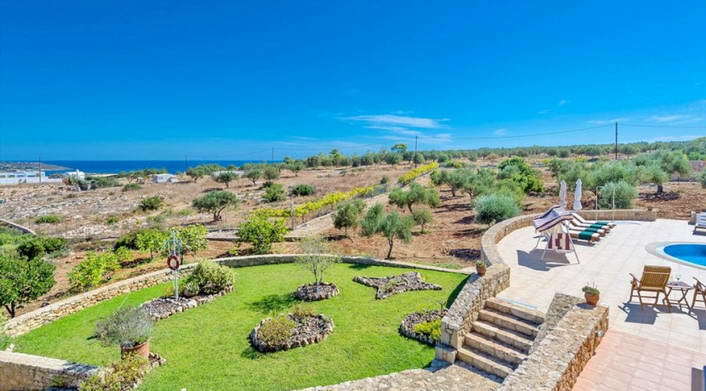 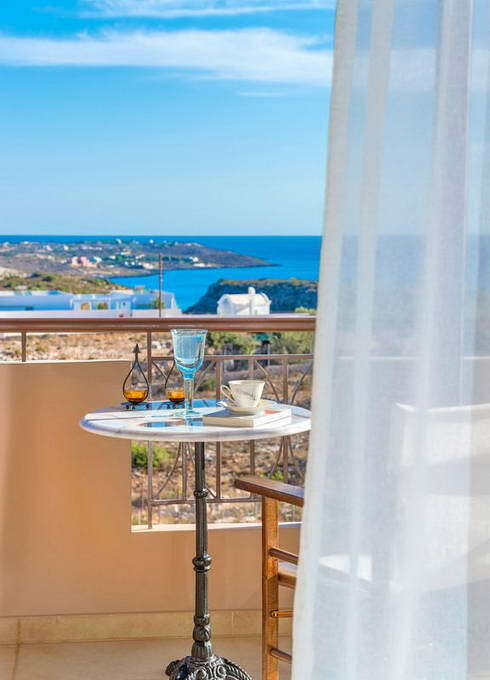 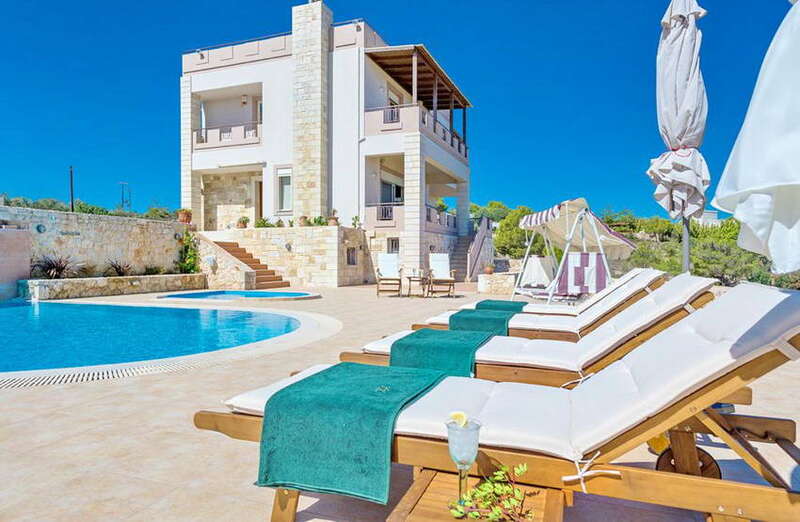 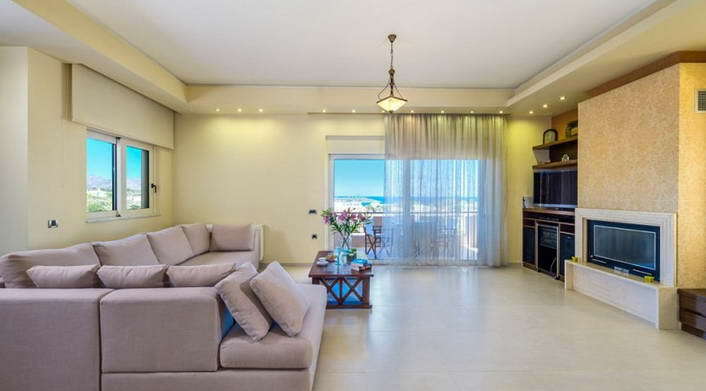 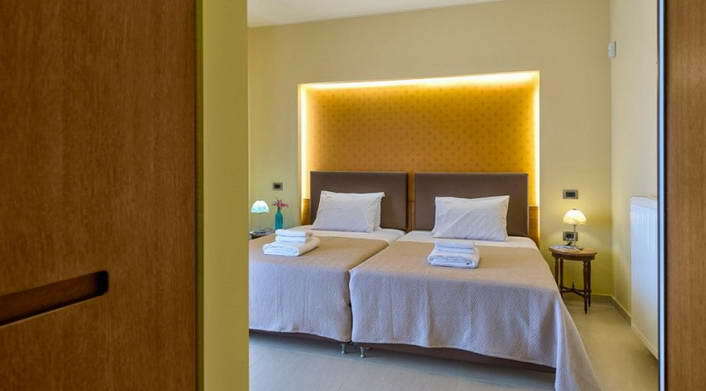 It is just 1 km from the sandy beach of Kalathas and 10 km away from the center of Chania. 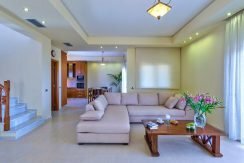 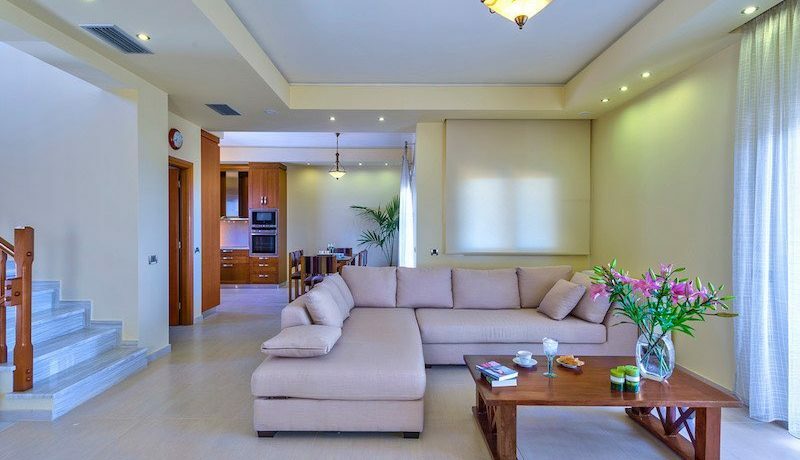 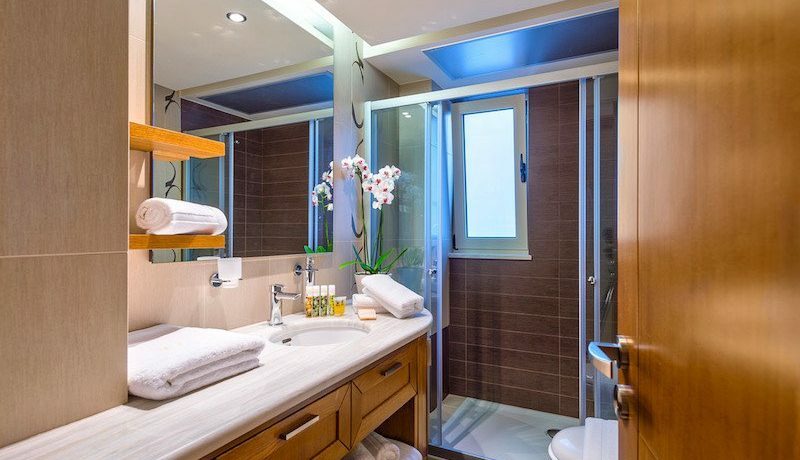 This beautiful luxury villa has been built on three levels and it offers 140 sq.m of living space. 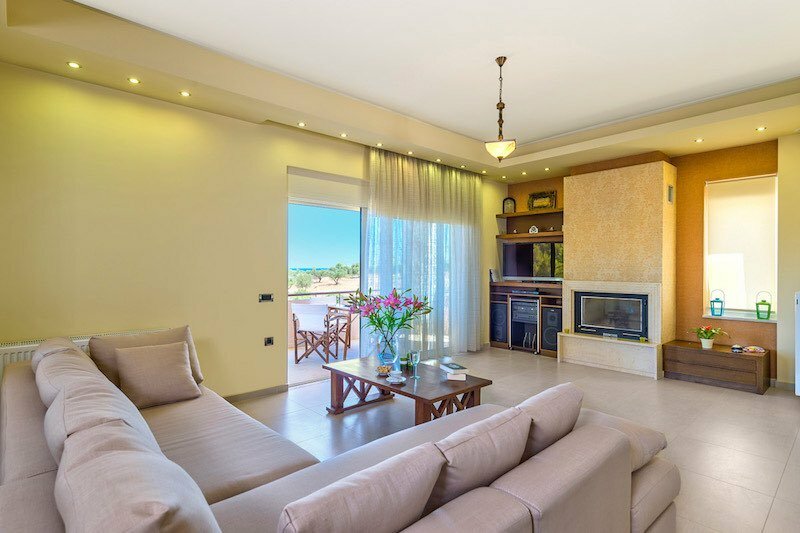 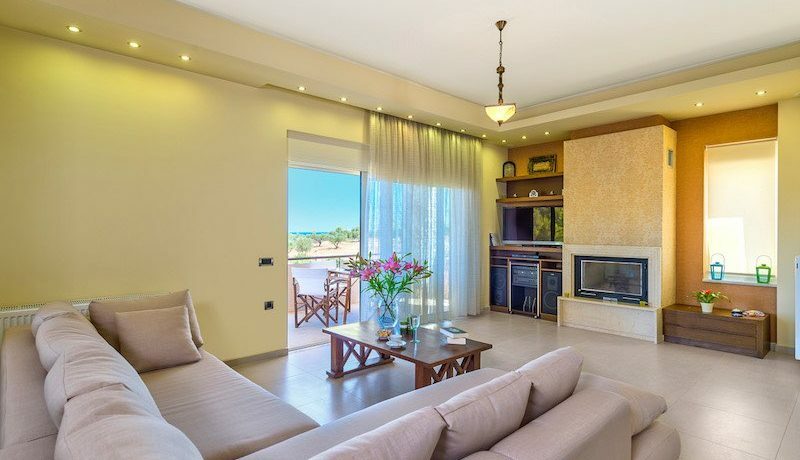 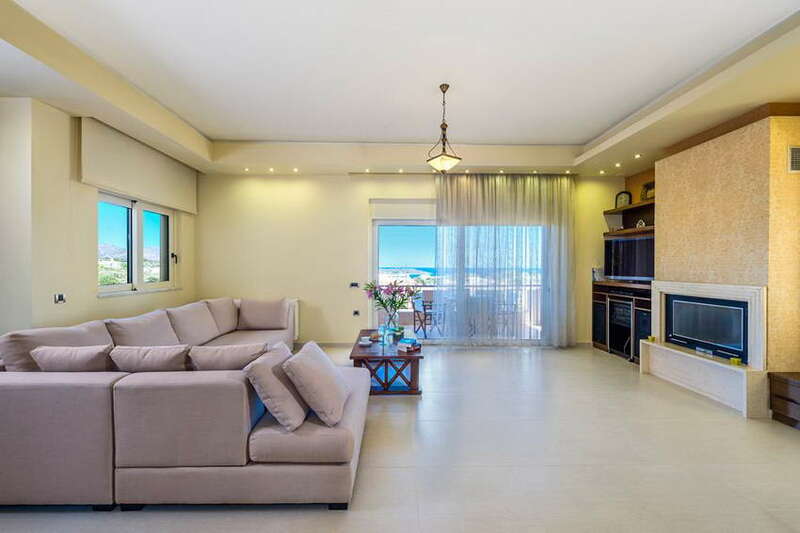 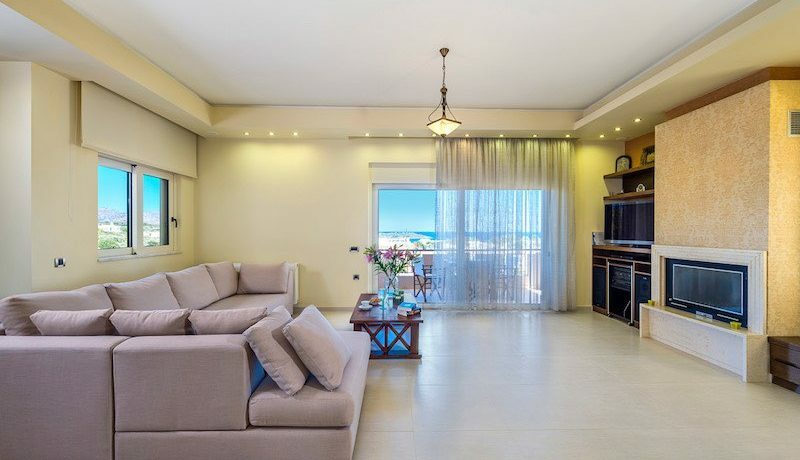 On the middle level of the villa, there is a spacious open plan living room, with a dining area and a fully equipped kitchen. The living room features a spacious seating area, a fireplace, a TV, a DVD player and a stereo music system. 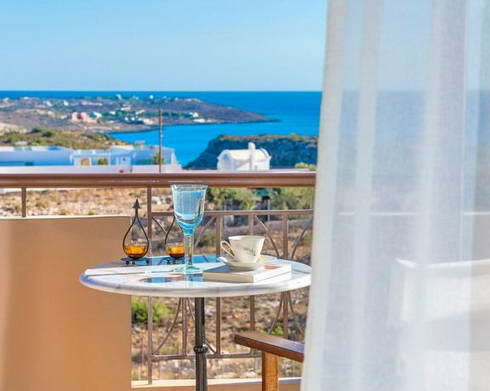 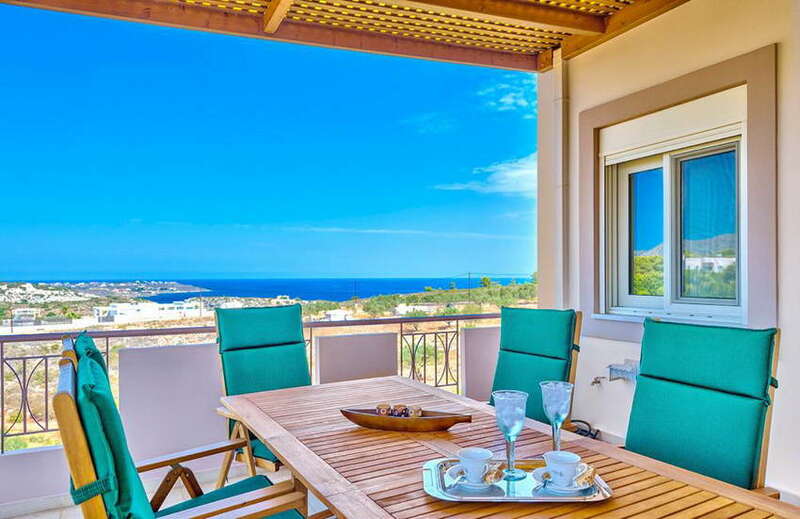 It has access to a furnished veranda with panoramic views of the sea and the garden. 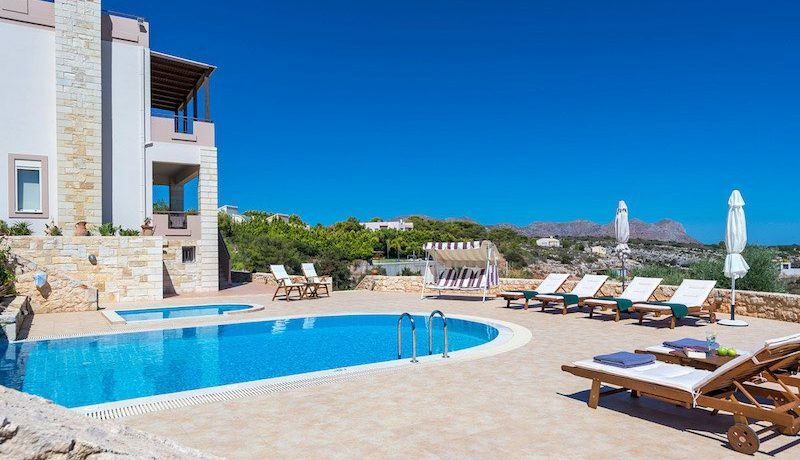 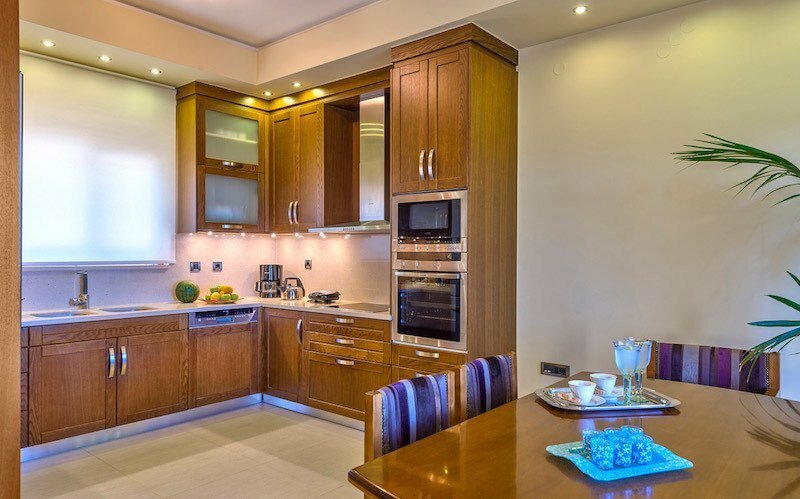 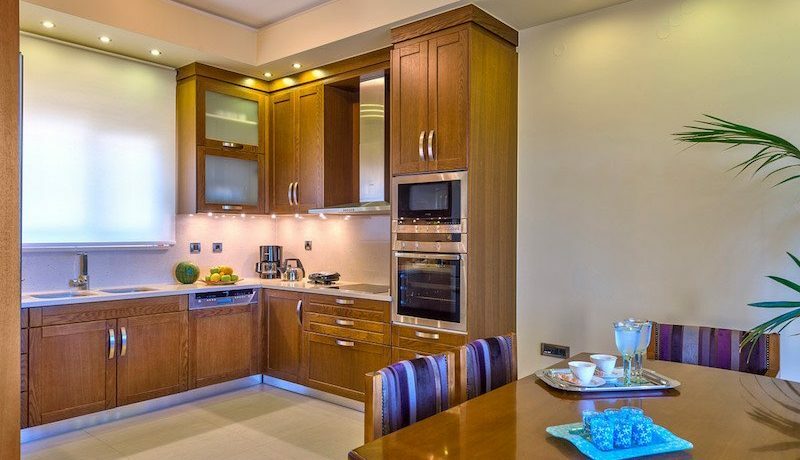 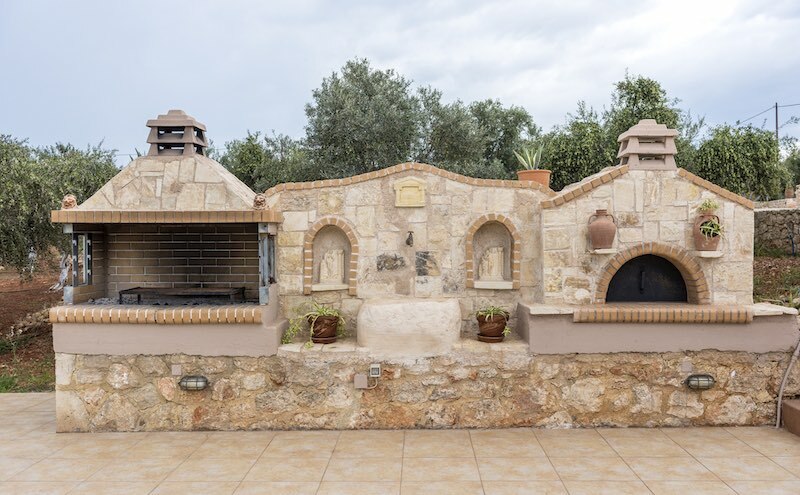 The kitchen has been equipped with ceramic hobs, an oven, a microwave oven, a fridge with a freezer, a dishwasher, a coffee machine and kitchen utensils.A WC is also available on this level of the villa. 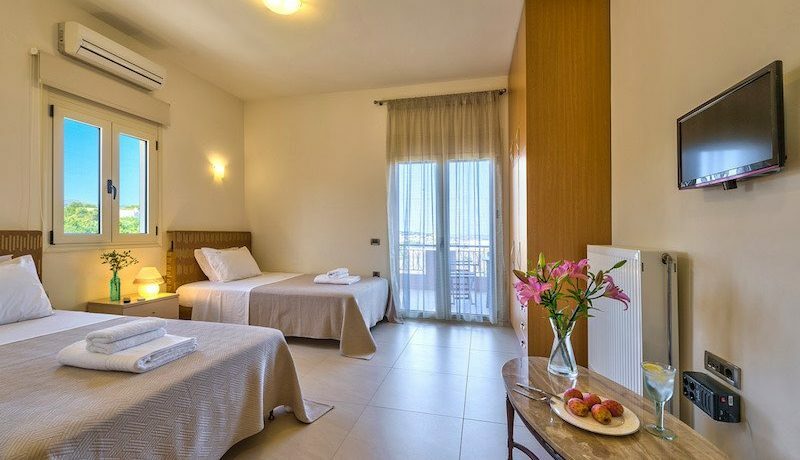 On the same level there is a studio with a separate entrance with 2 beds, a kitchenette with a fridge and a bathroom. 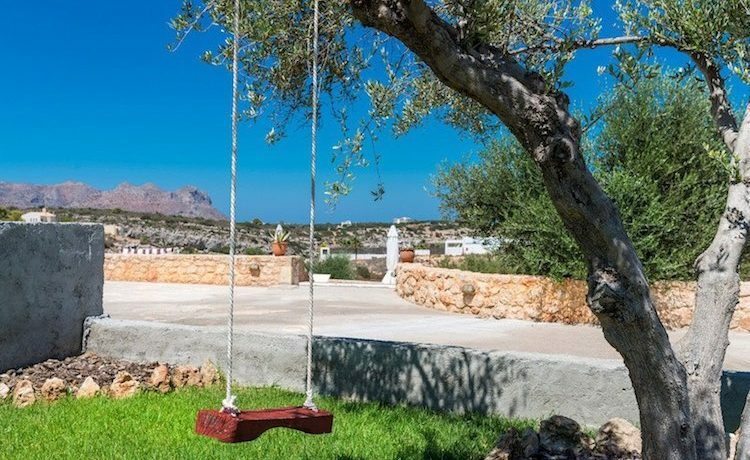 The studio includes TV and a spacious wardrobe and has access to a furnished veranda with sea, garden and mountain views. 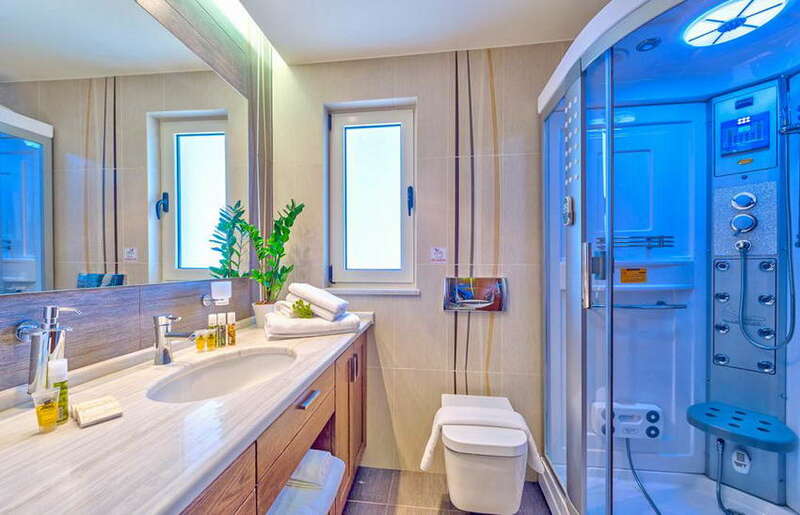 On the basement there is a laundry room, a storeroom, a toilet and enough space to accommodate 2 more people (if needed). On the top level, there are 2 bedrooms, one with a double bed and another one, with one single bed. 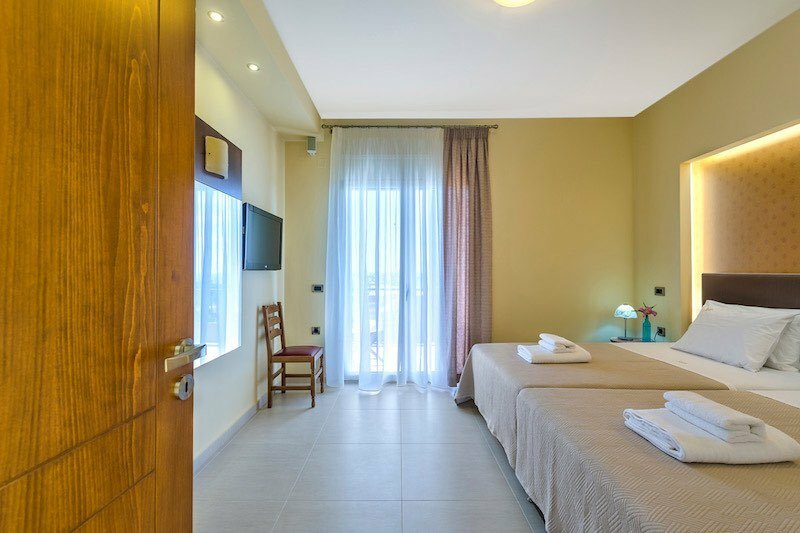 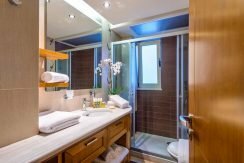 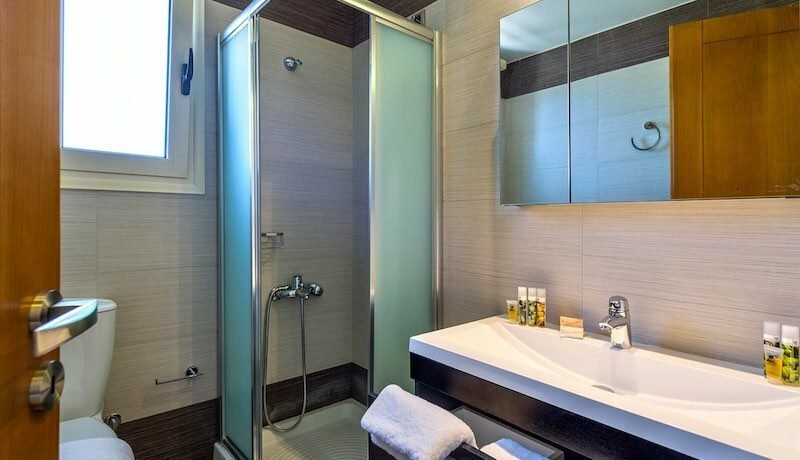 These bedrooms are air conditioned and share a spacious, luxurious shower bathroom and a veranda with an outdoor dining area. 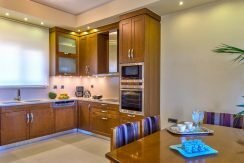 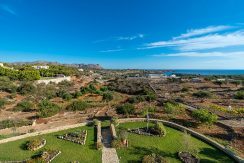 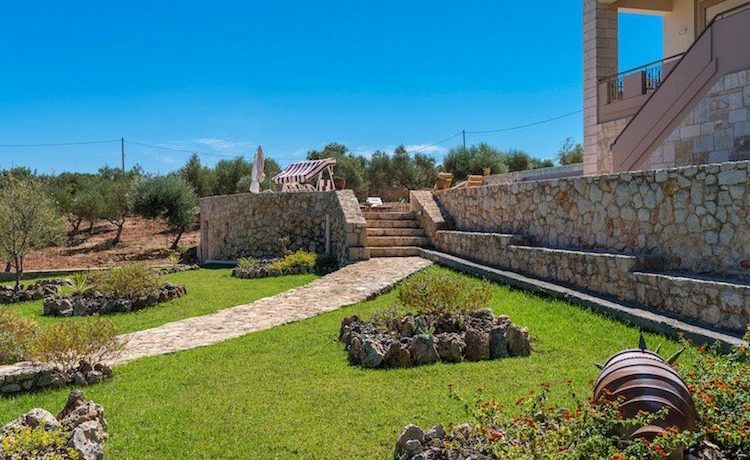 This villa for sale in Akrotiri Chania, has been constructed according to the latest ecological specifications. 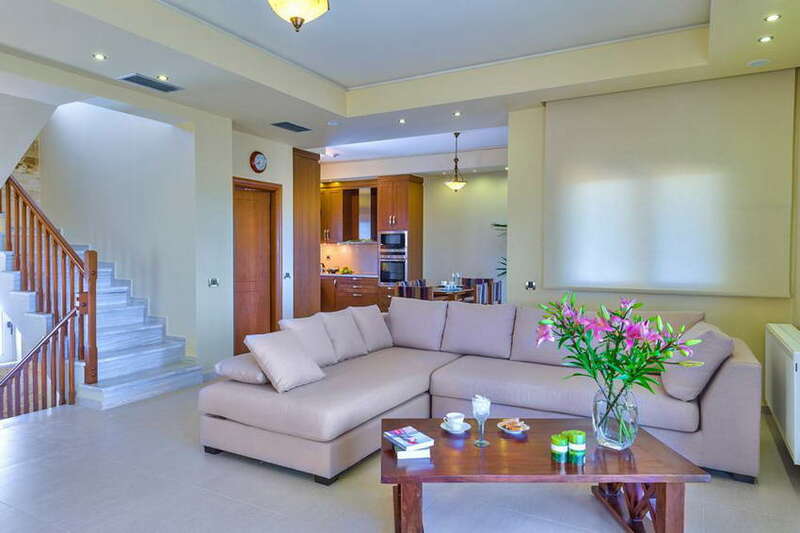 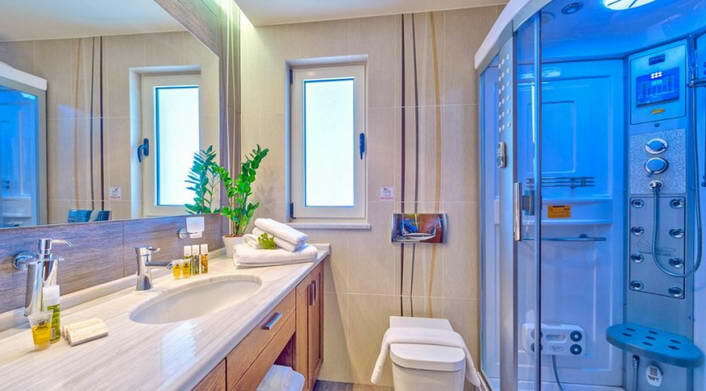 It has thermal and soundproofing insulation and the three levels of the villa are accessible through an elevator too. 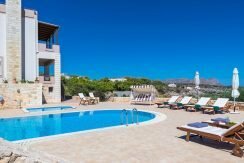 A private parking area is available within the premises of the property. There is also a private swimming pool with jacuzzi and a special childrens’ area surrounded by sunbeds and umbrellas. 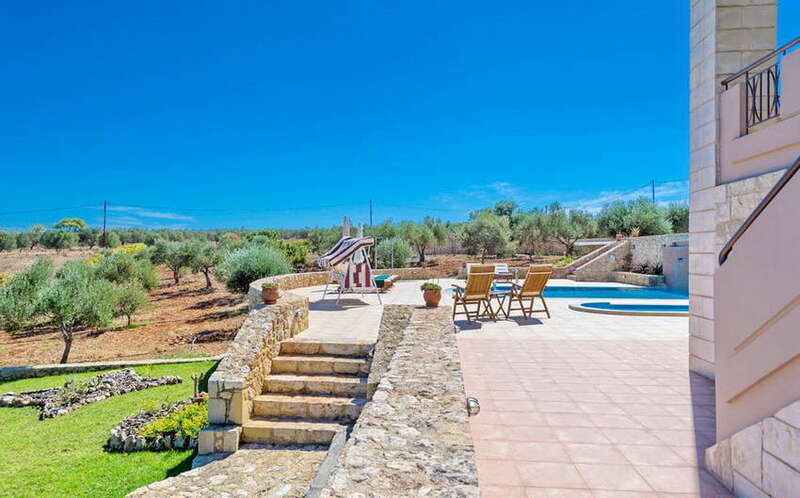 Next to the swimming pool there are barbecue facilities and an outdoor shower. 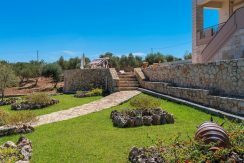 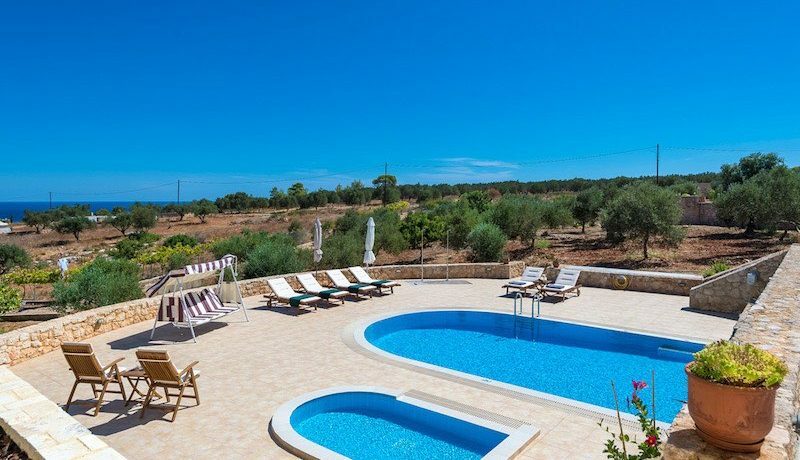 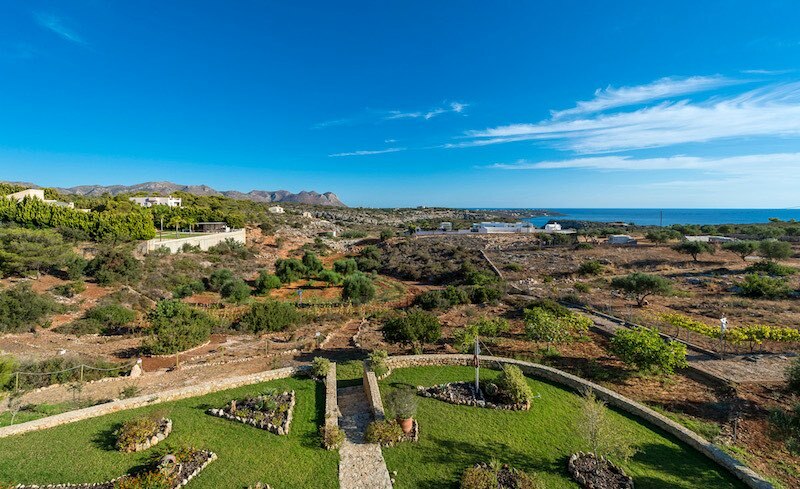 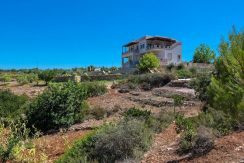 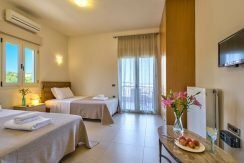 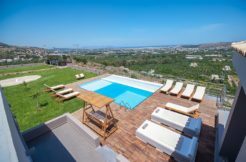 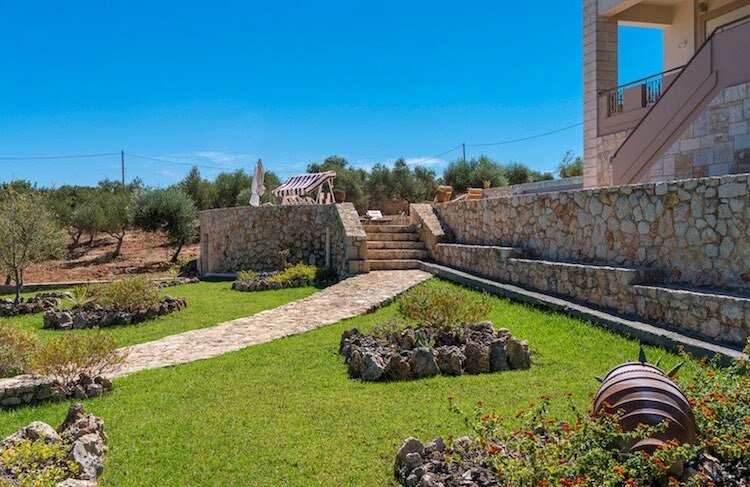 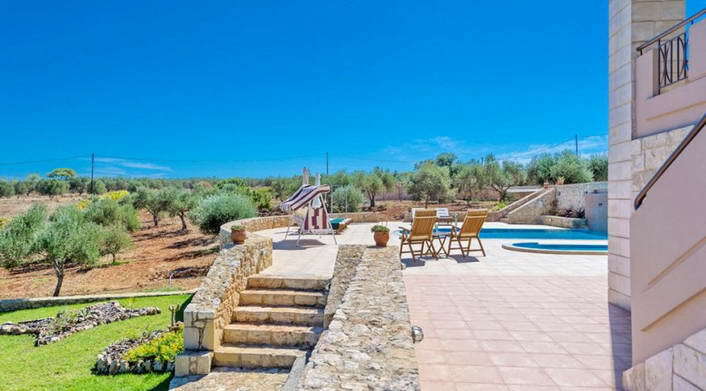 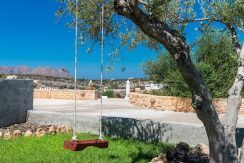 The villa has a fully landscaped garden and it is surrounded by an olive grove, vineyards, by a herb and vegetable garden all accessible only to the tenants of the villa. 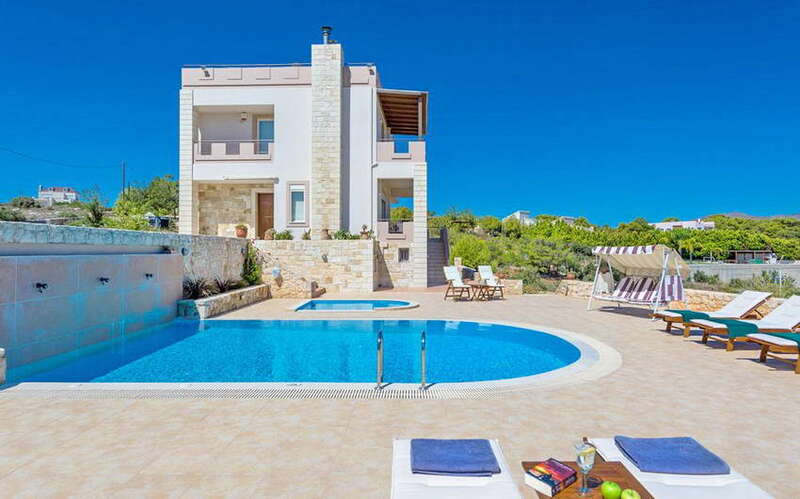 On the same plot there is another villa of the same size, which has not been fully completed. 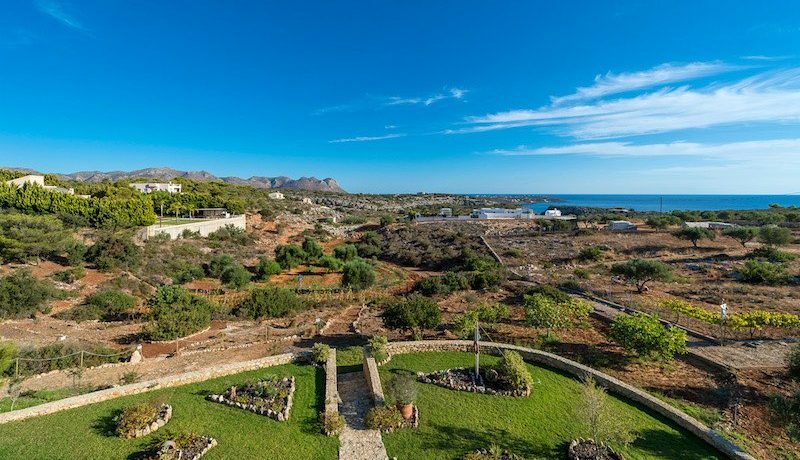 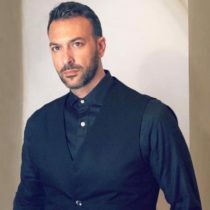 Additionally there is a remaining building density of 200sqms, making this property an ideal opportunity for an investment in tourism.